MIDLAND, TEXAS (June 30, 2008) The USA Softball team scored 13 runs in route to a 13-0 victory over the ASA Texas All-Stars in front of 6,371 at Citi Bank Ball Park in Midland, Texas to extend their KFC Bound 4 Beijing Tour record to 51-1. The team battled the West Texas wind but still connected on 17 hits, with Natasha Watley (Irvine, Calif.) explosive at the plate going a perfect 5-for-5 with three runs scored and three runs. Lead off batter Natasha Watley (Irvine, Calif.) wasted no time putting runners on taking a 1-0 pitch to left field for a triple. Lowe brought her home with a single to left field. A double play of a pop up by Crystl Bustos (Canyon Country, Calif.) and a putout at first when Caitlin Lowe (Tustin, Calif.) didn’t return to first, left the team with a 1-0 lead into the second. Cat Osterman (Houston, Texas) made her 13th start of the KFC Bound 4 Beijing Tour allowing a runner to reach in the first off a walk but allowing no runs to score. The ASA Texas All-Stars did what very few opponents this year have done loading up the bases in the third but Osterman did what she does best retiring the last batter swinging. Colleen Kimbro started it off in the third for the All-Stars reaching on a throwing error by Osterman. A single to shortstop and a base on balls loaded it up but a strikeout to Jordan Daniels kept runs off the board. Watley again led the team in the third with a single to third base. Lowe and Jessica Mendoza (Camarillo, Calif.) hit singles of their own to load up the bases for Bustos, with the crowd cheering for a homerun. Bustos did not disappoint the Midland crowd with a roped homerun to right field giving the team a 5-0 lead. Andrea Duran (Selma, Calif.) ripped a double to left field and was followed by Stacey Nuveman (La Verne, Calif.) with a walk. A single to centerfield by Lovie Jung (Fountain Valley, Calif.) plated Duran. Watley, with her second hit of the inning, hit a double over the left fielder’s head to clear the base paths and edge the lead to 8-0. The team tacked on two runs in the fourth taking advantage of two errors by the left fielder. Bustos singled advancing to second on an error by the left fielder Katy Gutierrez. Vicky Galindo (Union City, Calif.), entering to pinch run for Bustos, scored from second on another error by Gutierrez after she over threw on a single by Duran. A groundout RBI by Jung gave the Red, White and Blue a 10-0 lead after four. In the fifth inning, the team started playing by exhibition rules placing a runner at first to start off the inning. Nina Cabrales started out on first advancing to second on a fielder’s choice by Maritza Martinez who was also safe. A single to second base by Kimbro loaded the bases with no out but three strikeouts by the south paw Osterman left the bases loaded. In the bottom of the fifth, back-to-back singles by leadoff hitter Watley and Laura Berg (Santa Fe Springs, Calif.) set up the two-RBI double by Mendoza. A single by Kelly Kretschman (Indian Harbour Beach, Fla.) pushed Watley across the plate to give the USA Softball team a 13-0 win. Osterman was again tested in the seventh when a runner was put on second, eventually loading the bases off a single and a walk. A pop up to shortstop left the runners stranded to close out of the game. Osterman, with her 12th win of the season, struck out 13 while walking five and allowing three hits. The team is now on a much deserved week break after spending the month of June on the road. The team will meet back together in Portland, Ore., on July 8th for a game against the Portland ASA All-Stars at 7:00 p.m. at Erv Lind Stadium. FORT WORTH, TEXAS (June 29, 2009) Former TCU swimming standouts Jonathon Berrettini and Scott McCracken will travel to Omaha, Neb., to attempt to qualify for the 2008 Olympic Games in Beijing, China. Berrettini will compete in the 100-back event on June 30, while McCracken hopes to qualify in the 50-free on July 5. Berrettini, a native of Lewisville, Texas, put together one of the best seasons in TCU history, setting two new school records and qualifying for the NCAA Championships to become the first TCU swimmer to compete at the event since 1997. Berrettini set new TCU marks in the 100-back (48.16) and 100-free (44.70), and earned six All-Mountain West Conference selections. blistering time of 19.99 in the 50-free event this season. The Houston product won eight events during the 2007-08 season and earned five all-conference selections. HOUSTON, TEXAS (June 28, 2008) Houston Mayor Bill White today unveiled plans for a regional amateur sports complex to be built on Houston’s south side. The Mayor joined community partners to discuss the future facility and to announce plans for a private fundraising campaign to support development. The planned 100-acre, 18-field complex, bounded by Highway 288 and Kirby Drive on the east and west sides and Sims Bayou on the south, will provide a world-class soccer facility for Houston area youth and adult league play. It will immediately become a soccer destination for regional and major tournaments. The first phase of the project provides for street and infrastructure improvements and construction of eight soccer fields at a cost of $10 million and is to be completed by December of 2009. Within the next 90 days, public works officials will present to city council plans for infrastructure to support the facility and a contract ready to be awarded for the extension of Kirby Drive. Plans are being developed to make the complex the training home for the two-time MLS Cup Champion Houston Dynamo and its youth programs. Discussions are under way on a deal that would make the complex the practice home for the two-time MLS Championship Houston Dynamo. The City of Houston is in ongoing discussions with other adjacent property owners, including Wesley Church and the Houston Community College System, which is considering development of sports facilities on a 100 acre tract next to the planned park, in an effort to share the cost for infrastructure. The Houston Parks Board has agreed to participate in the effort to obtain funding for development of the facility. “In addition to soccer, the complex will provide opportunities for a variety of field sports, such as Lacrosse, which are growing in popularity in our city,” said Parks Board Executive Director Roksan Okan-Vick. The purchase of the land for the complex was approved by a unanimous vote of City Council on January 30, 2008. HOUSTON, TEXAS (June 27, 2008) Rice University distance runner senior Marissa Daniels has been selected to the prestigious 2008 ESPN the Magazine/CoSIDA Academic All-America First Team for women's track and field and cross country. In 2007, Daniels was named to the Academic All-America Second Team. From Pearland, Texas, Daniels holds a 3.86 grade point average (GPA) in kinesiology (sports medicine). She will be attending UT-Southwestern Medical School in Dallas, Texas. This season on the track Daniels held C-USA's top time in the 10,000m with NCAA provisional time of 34:07.60 (Mt. SAC, 4/18). She won the 10,000m title at the C-USA Outdoor Championship with a time of 36:22.93 and She finished second in the 5000m. Daniels also placed fourth at the C-USA Indoor Championship in the 3000m and placed seventh in the 5000m. At the C-USA Cross Country Championship, Daniels finished third with a time of 17:50.3. Daniels' efforts helped the Rice Owls win Conference USA team titles in cross country, indoor track and field, and outdoor track and field this past season. To be eligible, a student-athlete must be a varsity starter or key reserve, maintain a cumulative grade point average of 3.20 on a scale of 4.00, have reached sophomore athletic and academic standings at his/her current institution and be nominated by his/her sports information director. Since the program's inception in 1952, CoSIDA has bestowed Academic All-America honors on more than 14,000 student-athletes in Divisions I, II, III and NAIA covering all NCAA championship sports. HOUSTON, TEXAS (June 26, 2008) Kevin Mouton, who has 16 years of collegiate coaching experience including the last six at Oregon State, has been named to the Rice men’s basketball coaching staff. Rice head coach Ben Braun made the announcement Wednesday. After five years on the Oregon State staff, Mouton was elevated to associate head coach prior to the 2007-08 season, and in January, stepped in as the interim head coach. Before his stint at Oregon State, Mouton coached two seasons at Nebraska (2000-02). In addition to on-floor coaching, among his responsibilities were on-campus recruiting and serving as an academic advisor for the Cornhuskers’ program. Mouton’s collegiate coaching career began at the Colorado School of Mines (1992-93). He went on to coach at Butler (1993-95), Eastern Illinois (1995-96), New Hampshire (1997-99) and St. Mary’s (1999-2000). He also coached two years at Logan, Calif., High School (1990-92). Mouton began his playing career at the University of Oregon and after a year at Jamestown, played his final two years at the University of San Francisco. He graduated from USF with a bachelor’s degree in sociology in 1989. He and his wife Jacquie are the parents of two sons, Adrian (15) and Elijah (4), and a daughter, Whitney (10). While Mouton grew up in Northern California, his roots are the Beaumont/Orange area of southeast Texas. His parents now reside in Houston. PISD Coaches Compete in Houston Senior Olympics. PASADENA, TEXAS (June 25, 2008) One former and two current Pasadena ISD swimming coaches recently competed in the 20th Annual Houston Senior Olympics, and as a result of their performances, qualified for the Texas State Senior Olympics in September. Former Pasadena ISD aquatic director and J. Frank Dobie head swimming coach Dennis Shippey, along with Pasadena High school head swimming coach Darla Kelly and Sam Rayburn High School swimming coach Robert Kelly competed in the local games at Lamar Senior High School in Houston. Shippey, competing in the 60-64-year-old age group, won six gold medals in the 50, 100, and 200-yard breaststroke, 100-yard backstroke, 50-butterfly, and 100-yard individual medley. Darla Kelly, competing in the 50-54-year-old age group garnered a silver medal in the 50-yard breaststroke and three bronze medals in the 50-yard backstroke and 50 and 100-yard freestyle. Robert Kelly, also competing in the 50-54-year-old age group, won three gold medals in the 50, 100, and 200-yard breaststroke, a bronze medal in the 50-yard backstroke and 4th place in the 50-yard freestyle. The top four finishers in each event at the Houston games qualified for the Texas Senior Olympics at Temple High School in Temple, Texas. The top three finishers in each event at the state games will qualify for the 2009 National Senior Games at Stanford University in Palo Alto, California in August, 2009. The Houston Senior Olympics were sponsored by St. Joseph’s Medical Center and the Jewish Community Center. Athletes 50-years-old and over are eligible to compete. COLUMBUS, OHIO (June 24, 2008) Houston's Shanay Briscoe won the women's high jump at the 2008 USA Junior Track & Field Championships at the Jesse Owens Memorial Stadium at The Ohio State University in Columbus, Ohio. Briscoe tied the stadium record with her clearance of 1.80m/5-10.75 with 2008 Texas state champion Brigetta Barrett (Duncansville, Texas) taking second with a height of 1.77m/5-9.75. Florida state champion Maya Pressley (Coconut Creek, Fla.) was third at the same height. Briscoe and Barrett each will compete in Poland at the IAAF World Junior Championships. "I was ready two hours before but with the rain and everything, I just tried to stay up. I was good whenever I came out," said Briscoe. "I didn't jump my best, but I did okay. I'm excited about making the team. I've never been to Poland so it'll be great." PASADENA, TEXAS (June 23, 2008) Pasadena High School head swimming coach Darla Kelly has been selected by the Institute for International Sport as the commissioner of swimming for the 3rd United States Scholar-Athlete Games. The Games will take place on the campus of the University of Rhode Island from June 27 to July 5, 2008. Kelly was selected for the position from a group of applicants and will direct all the swimming and finswimming activities and competition at the Games. The United States Scholar-Athlete Games is held every four years and brings together over 3,000 athletes and 300 coaches and staff for training and competition in basketball, volleyball, soccer, lacrosse, track and field, golf, swimming, finswimming, field hockey, tennis, rugby, squash, softball and baseball. Kelly will oversee over 100 athletes and 10 coaches whom will participate in the swimming and finswimming competition. In addition, she will set up and direct the training programs and the competitive meet for the swimmers and finswimmers. Previous she has served as a coach at the Games in 1999 and 2003 in addition to being a coach at the 1997, 2001, and 2005 World Scholar-Athlete Games. In the 1997 and 2001 Games, she was the one of the co-head swimming coaches for the United States and in 2005, served as the head coach of the Lithuanian team. Kelly was selected for the job based on her coaching and administrative experience and her pervious national and international coaching positions. In 2000, she was the assistant coach of the United States National Finswimming Team at the 2000 World Finswimming Championships in Majorca, Spain. The Games will be on the campus of the University of Rhode Island on June 28-July 5 and will include athletes from all 50 states and special invitees from over 15 countries. Kelly is the first woman to be selected as swimming commissioner for either the United States or World Scholar-Athlete Games. “I was honored to be selected for this position. It is a great opportunity and I hope to do the very best for the athletes, coaches and staff of the Games. I have a good group of coaches to work with and I know they will do their very best to make these Games the best ever,” said Kelly. Kelly will be joined in Rhode Island by two coaches with local ties. Sam Rayburn High School swimming coach Robert Kelly, (Kelly’s husband) will serve as one of her staff coaches. In addition, Pasadena High School teacher Lisa Hernandez. Hernandez is a UIL swimming official and a volunteer assistant swimming coach for Pasadena High School. PHILADELPHIA, PENNSYLVAINA (June 22, 2008) Jonathan Horton of Houston and 2004 Olympic all-around champion Paul Hamm of Waukesha, Wisconsin were nominated to the 2008 U.S. Olympic Men’s Gymnastics Team following the conclusion of the yesterday's men’s competition at the 2008 U.S. Olympic Team Trials – Gymnastics, held at the Wachovia Center in Philadelphia. The balance of the squad will be nominated to the U.S. Olympic Team toDAY, pending approval from the U.S. Olympic Committee. The final day of the women’s competition at the U.S. Olympic Team Trials - Gymnastics is today (Sunday) at 6 p.m. ET. Horton finished first in the weighted, combined all-around rankings from the Visa Championships and U.S. Olympic Team Trials – Gymnastics. Hamm broke the fourth metacarpal in his right hand on the first day of competition at the 2008 Visa Championships, May 22-24 in Houston, and filed a petition to the Olympic Team, which was accepted. “I have a lot of work to do to get healthy and show the committee I’m ready,” said Hamm, who competes for Team Chevron. The five-man men’s selection committee named both Horton and Hamm to the team after no athlete met the minimum requirements for automatic qualification, as outlined in the selection procedures. To be automatically named to the team, an athlete needed to finish in the top two in the combined, weighted all-around rankings from the two selection events, as well as place in the top three of six events using the combined results. Horton earned 90.750 points in the overall Olympic selection rankings, followed by Joseph Hagerty of Rio Rancho, N.M./Team Chevron, in second with 89.940 points and Raj Bhavsar of Houston/Team Chevron in third at 89.860. Horton finished first in tonight’s all-around competition with a score of 91.650. David Durante of Garwood, N.J./Team Chevron, was second with a 90.950 and Bhavsar was third with a 90.200. After four rotations, Hagerty was leading the weighted all-around standings with a score of 81.660, followed by Bhavsar with an 81.235 and Horton with an 81.210. In the fifth rotation, Horton posted a 16.100 for his handspring double front vault, and moved into first place in the weighted rankings with an 86.055. Hagerty’s 13.500 on pommel horse dropped him to second with 85.710 points, and Bhavsar was third with an 85.435. The high scores of the day were: Sean Golden of Camden, N.J., on floor exercise, 15.700, and vault, 16.400; Durante on pommel horse, 15.050; Kevin Tan of Fremont, Calif., on still rings, 16.550; Raj Bhavsar on parallel bars, 15.700; and Morgan Hamm on horizontal bars, 15.500. Tickets are still available for the U.S. Olympic Team Trials – Gymnastics, and may be purchased online at ComcastTIX.com, by phone at 1-800-298-4200, or at the Wachovia Center Box Office. Visa is the only card accepted for the 2008 U.S. Olympic Team Trials - Gymnastics. 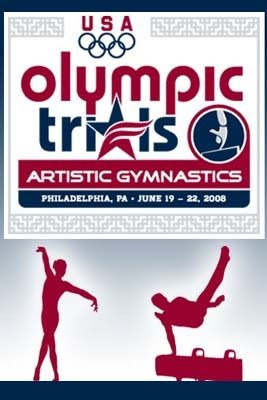 Past sites for the U.S. Olympic Team Trials for gymnastics are: 2004, Anaheim, Calif.; 1996 and 2000, Boston; 1992, Baltimore, Md. ; 1988, Salt Lake City, Utah; and 1980 and 1984, Jacksonville, Fla. The U.S. Olympic Team Trials for all sports is a collaborative, three-way partnership between the U.S. Olympic Committee, the national governing bodies and the local organizing committees. MIDLAND, MICHIGAN (JUne 21, 2008) Left-handed pitcher Cat Osterman (Houston, Texas) tossed a one-hit performance on Saturday afternoon at Currie Stadium as the USA Softball Women’s National team cruised to a 14-0 shutout over the Midland Lady Explorers. Improving to 48-1 on the KFC Bound 4 Beijing tour, the U.S. scored in four of six innings as 5,023 fans enjoyed the sunny afternoon game. Osterman (11-0) tallied 11 strikeouts in 19 batters faced with catcher Stacey Nuveman (La Verne, Calif.) who was 2-for-3 with one RBI. Third baseman Crystl Bustos (Canyon Country, Calif.) had a remarkable day going 4-for-4 with three RBI. Kelly Kretschman (Indian Harbour Springs, Fla.) was 2-for-4 with four RBI including two doubles. Bustos roped in her 70th RBI of the tour in the first inning giving the U.S. a 1-0 advantage. Left-handed slapper Caitlin Lowe (Tustin, Calif.) beat out a play at first base to give the U.S. its first hit of the contest and then stole second base before scoring on the Bustos hit. The U.S. opened up the game in the bottom of the third inning scoring four runs on five hits and one Lady Explorers error. Natasha Watley (Irvine, Calif.) laid down a base hit bunt to begin the inning and then stole her 18th base of the tour moving quickly to scoring position. Lowe moved Watley to third with a ground out before Jessica Mendoza (Camarillo, Calif.) doubled to left field for the 2-0 lead. It was another two-bagger for the U.S. as the next hitter Bustos connected on her second hit in as many at bats with an RBI plating Mendoza. Two more runs would score for the 5-0 lead with an Andrea Duran (Selma, Calif.) RBI single and a fielding error from the Lady Explorers first baseman. Kelly Kretschman (Indian Harbour Beach, Fla.) sent a base clearing stand-up double to left center in the bottom of the fourth inning scoring three runs for the 8-0 advantage. The bases were loaded thanks to a walk from Lowe and singles from Mendoza and Bustos. One more run gave the U.S. a solid 9-0 lead with an RBI single from Lovieanne Jung (Fountain Valley, Calif.) scoring Kretschman. Kim Cozat saw the only hit of the game for the Midland Lady Explorers in the top of the fifth inning when she connected on an Osterman pitch that she drove through the left side. Five runs in the fifth inning was what the U.S. put up as they moved to the eventual 14-0 victory. A new Midland pitcher in Stacy Kraatz, the U.S. used five hits and two Explorer errors to add the five runs to the stat sheet. A leadoff single from Lauren Lappin (Anaheim, Calif.) jump started the drive before she would later score on a Bustos single. Kretschman then recorded her second double scoring Mendoza who earned a base on balls. Vicky Galindo (Union City, Calif.) had an RBI single then to score another run while a wild pitch plated Kretschman. The final run was the product of a Nuveman single that plated Galindo. The U.S. is headed to Ashland, Ohio on Sunday afternoon for competition on Monday evening in Ashland. Game time is 7 p.m.
HOUSTON, TEXAS (June 21, 2008) The Houston Dynamo and D.C. United announced today that their postponed game from June 4 will be rescheduled for Tuesday, July 22, at RFK Stadium in Washington, D.C., at 6:30 p.m. CT. The match will be the second in four days between the teams after they meet in SuperLiga action on July 19. Tickets for the June 4 game will be honored on July 22. The Houston Dynamo, two-time defending MLS Cup champions, play a road match in Colorado on Saturday, June 21, before returning home to host rival FC Dallas on Thursday, June 26, at Robertson Stadium. PHILADELPHIA, PENNSYLVANIA (June 20, 2008)This document includes the results from the first night of the men’s competition at the U.S. Olympic Team Trials Gymnastics (listed first), as well as the current rankings for the men based on the Olympic selection formula that includes combined results from the 2008 Visa Championships and U.S. Olympic Team Trials. They are being held at the Wachovia Center in Philadelphia (Texas gymnasts are in red). HOUSTON, TEXAS (June 19, 2008) The 2008 Texas Bowl will be played on Tuesday, December 30 at Reliant Stadium, the Texas Bowl Committee announced today. The announcement was made in front of a crowd of over 200 at a Texas Bowl luncheon held at Reliant Stadium. December 30 marks the latest date for the Texas Bowl in its three-year history. The bowl was played on December 28 in each of the last two years. The 2008 edition will feature teams from the Big 12 and Conference USA. The game will be broadcast nationally on NFL Network. The Texas Bowl also announced an option to select Navy if the Midshipmen are bowl-eligible. Navy boasts a strong nationwide following, including a significant military population in the Greater Houston area. Navy has played in bowls following each of the last five seasons, including an appearance in the Houston Bowl in 2003 vs. Texas Tech. Speakers at the luncheon included new University of Houston head coach Kevin Sumlin, Houston Texans preseason TV analyst Spencer Tillman and Texans linebacker and Texas Bowl alumnus Zac Diles. Houston played in the 2007 Texas Bowl prior to Sumlin’s arrival, and Diles played in the inaugural Texas Bowl with Kansas State in 2006. In two years, the Texas Bowl has generated more than $50 million in local revenue and has built a season ticket base of over 20,000. The 2007 Texas Bowl was a rousing success as TCU defeated Houston, 20-13, in front of 62,097 fans—the third-largest crowd ever to see a college bowl game in Houston. Over 35,000 tickets sold before the matchup was announced. The inaugural Texas Bowl featured a Rutgers team that enjoyed a top 10 ranking for much of the season and a Kansas State squad which closed the season strong under first-year head coach Ron Prince. Rutgers won the inaugural Texas Bowl, 37-10, behind an MVP performance from RB Ray Rice who ran for 170 yards and a touchdown. Sox scored a run in the bottom of the ninth, and the game ended in a 2-2 tie. 3-3; Harwich eventually won the game 6-5 in 11 innings. Chatham A's. Miller is 5-for-11 with two RBI in the team's first three games. Wareham Gatemen; he is 1-for-7 with one RBI through the first three games. COLORADO SPRINGS, COLORADO (June 17, 2008) U.S. Army Marksmanship Unit (USAMU) 2008 Olympic Team members as well as Army Reservist Libby Callahan, who is also a member of the 2008 U.S. Olympic team, will be making a brief appearance on NBC’s morning news program “Today” with Matt Lauer and Meredith Vieira on Wednesday, June 18. The segment is expected to air at approximately 8:04 a.m. “Today” runs from 7:00 a.m. – 11:00 a.m. Monday through Friday on NBC. The USAMU athletes who will be appearing on “Today” include: Michael Anti (Winterville, N.C.), the 2004 Olympic silver medalist in Men’s 3 Position Rifle, who secured a spot on his fourth Olympic team, this time in Men’s Prone Rifle. Two-time Olympian Jason Parker (Omaha, Neb. ), earned two spots on the 2008 U.S. Olympic Team in Men’s 10m Air Rifle as well as Men’s 3 Position Rifle. Glenn Eller (Katy, Texas) secured his third consecutive Olympic team berth in Men’s Double Trap, along with his Double Trap teammate Jeff Holguin (Yorba Linda, Calif.), who earned his first spot on the U.S. Olympic Team. Daryl Szarenski (Saginaw, Mich.), a two-time Olympian, will represent the U.S. in Men’s Free Pistol. Libby Callahan (Columbia, S.C.), 56, is the eldest member of the 2008 U.S. Olympic Shooting team and also the oldest known American woman overall to compete in the Olympic Games. Equestrian Kyra Dowton previously held the record at age 55. Dowton competed in the 1968 Olympic Games held in Mexico City. Callahan will be competing in the Women’s Sport Pistol event in Beijing. HOUSTON, TEXAS (June 16, 2008) Head coach Greg Williams announced the hiring of Jae Cross Monday morning as Director of Operations for women's basketball effective immediately. "I am very pleased to have Rice University as a new member of my family," Cross said. "This is an exciting new challenge and a fantastic opportunity for my career. I look forward to working with Coach Williams and being a member of his staff." Cross played professionally for the WNBA's Detroit Shock (2001-04) and San Antonio Silver Stars (2006) in addition to being a team representative for the Phoenix Mercury (2004-05). Cross also was a member of the Australian national team for 12 years (1995-2006) and won a bronze medal at the 2002 World Championships. The Australians claimed a pair of Oceania Gold Medals in 2003 and 2005 en route to qualifying for the Olympics. Cross started her career playing for the Adelaide Lightning of the Women?s National Basketball League (WNBL) where her squad took home a trio of national champions (1995, 1996 and 2001). "I am very happy to have Jae on our staff," Williams said. "As a former WNBA player, she will contribute much to our program with her vast experience and knowledge of the game. Jae brings high energy and enthusiasm everyday and will relate well to all of our players." HOUSTON, TEXAS (June 15, 2008) Carlos Vela scored off a missed shot by Luis Perez and kicked it in for Mexico's first goal in their 2-0 win over Belize in their World Cup Qualifer match in Houston. Jared Borgetti scored the second goal for Mexico on a penalty kick during stoppage time to round out the scoring. The match was the first of a two-game aggregate series, with the second game to be played in Monterrey, Mexico on Saturday, June 21. Belize, ranked No. 172 in the world, was a huge underdog to 14th-ranked Mexico. However, Belize held Mexico at bay, with its defense consistently turning back Mexico's attacks to keep the score 0-0 at the half. Belize goalkeeper Shane Orio blocked three shots the first 25 minutes, including a leaping block of a power shot up the middle by Andres Guardado. Orio also stopped a close-in shot from the right side by Fernando Arce in the 39th minute. Mexico was dominant in the game, taking 12 shots the first half to only one by Belize. Mexico also had 11 corner kicks to one by Belize the first half. Belize, playing in the second round of qualifying for the first time ever, got another dramatic save in the 71st minute when Orio was taken out of the play and Trevor Lennen went into the goal to kick out a short shot at the last second. Belize's offense was lacking as it managed only two shots on goal the entire game. CORPUS CHRISTI, TEXAS (June 15, 2008) The Bay Area Toros stood one game from first place at the start of this evening's game and Corpus Christi was determined not to share the top spot with the visiting Toros. Bay Area had already accomplished what no other team in the league could by finally breaking the BeachDawg’s unblemished record at home by winning yesterday 3-1. To finish the series tied at two apiece was considered a perfect Father’s Day Gift for those in the Toros organization. The game began as though the Toros were not determined enough to reach their goal as starting pitcher Alex Fernandez would only last into the Third Inning giving up three runs. His relief would follow suit allowing two additional earned runs. Entering the late innings, the Toros found themselves in the hole 5-1. BeachDawg starting pitcher Gustavo Vazquez had handled the Toros well through the first six innings but after retiring one in the Seventh, he had to leave the mound after injuring his back. His relief, Garardo Valera, would enter the game with high hopes since the Toros seemed to not be able to muster any offense. Valera, however, would walk the first batter he faced and then proceed to hit the next, loading the bases since a Toro had reached prior to Vasquez’s exit by en error. What occurred next was a series of mistakes which propelled the Toros to score six runs, all of which were unearned. During the fiasco, the Toros’ bats would come alive. Two runs reached home each on a Greg Plecki single and a Grant Massie triple . After the dreadful inning, Corpus Christi could not recover and closer Ryne Nelson would enter the game for Bay Area and earn his fourth save. Valera would be credited with the loss (0-1) and Toro pitcher Marcus Moore, who pitched last before the surge, was given the win (1-0). Both teams are now tied in first place. HOUSTON, TEXAS (June 14, 2008) Hoping to keep their dream alive of advancing to World Cup 2010, the tiny country of Belize takes on Mexico in the FIFA World Cup Qualifier at Reliant Stadium in Houston on Sunday, June 15. Belize will face predominately Mexico-friendly crowd in the first of two matches, which will determine the qualifier to the next round. Tomorrow’s game at Reliant Stadium is technically a home game for the Belizeans, as their country has no stadium that meets FIFA requirements. The teams will play again in Monterrey, Mexico on June 21, with the team with the highest aggregate score advancing to the next round. TexSport Publications will be on hand to bring you coverage from Reliant Stadium. CORPUS CHRISTI, TEXAS (June 13, 2008) The Bay Area Toros (11-8) and the Corpus Christi BeachDawgs (12-7) entered last night's game tied atop the Continental Baseball League standings and were out to vie for the coveted top spot. By the end of the night both teams played a defensive battle that was decided by costly errors. The Bay Area Toros would work toward the opening score when lead-off hitter Grant Massie reached base on a single and was pushed along by a sacrifice bunt and then a groundout. While on third, BeachDawg starting pitched Ryan Kondratowiz would make an errant pitch which would allow for Massie to dart home providing the Toros with a 1-0lead which they would enjoy into the following inning. In the Seventh Inning, Toro reliever Loren Lauver would walk the lead-off batter, Earl White. White would then manage a stolen base and would eventually advance to third on a passed ball between Lauver and catcher Kyle Wells. The slip would cost the Toros their lead as Michael Estrada would slice a ball down the left field line bringing White home. The Toros would fail to break the tie in the Eighth Inning and would bring pitcher Will Smeltzer into the game in the bottom of the inning to speed through the Corpus order. Unfortunately, mistakes continued to pile up for the Toros. BeachDawg Tyler Kmetko would reach on an error and would be followed by a base-hit bunt by Brad Coleman. The play would develop when Smeltzer could not reach the ball in time. The following batter, Brandon McCabe, would reach on yet another error. With bases loaded, Kmetko would cross homeplate on a passed ball and Coleman would score on a sacrifice fly. The lead would hold for Corpus as Bay Area could not produce in the final inning. Both teams will continue the fight for first tonight at 7:05PM in Corpus Christi. HOUSTON, TEXAS (June 13, 2008) The teams and sites for the 2008 edition of SuperLiga was recently announced. The SuperLiga is a North American soccer competition between teams from Mexico's Primera División and the Major League Soccer. SuperLiga will decide the best in the region and will also award $1,000,000 to the winner; the heftiest winner’s purse in North American soccer history. The second edition of the cross-border showdown is set for July 12 to August 5. The Houston Dynamo, DC United, New England Revolution and Chivas USA will represent MLS while Chivas Guadalajara, Atlante, Pachuca and Santos will represent Mexico. All times are Eastern Time Zone. DES MOINES, IOWA (June 13, 2008) Rice University's Rachel Greff advanced to today's pole vault finals at the NCAA Championships after clearing 4.10m/13-5.25. The senior passed on three attempts at 3.75m/12-3.5 and then promptly cleared 3.90m/12-9.5 and 4.00m/13-1.5 on her first attempt. Greff then cleared 4.10m/13-5.25 on her second attempt. The 4x100m relay team of Sarah Lyons, Shakera Reece, Brittany Washington, and Desarie Walwyn did not make it out of preliminaries after being disqualified for passing the baton outside the 20m-passing zone. Reece earned a trip to the semi-finals of the 100m with a time of 11.86. Her teammate, Walwyn, ran a 12.06 and did not advance. Lyons, competing in the 400m, did not qualify for the semi-finals after posting a time of 54.42. In the 3000m steeplechase, Nicole Mericle ran a time of 10:30.97 and did not advance. Freshman Allison Pye posted a time of 17:36.03 in the 5000m, but did not qualify for the semi-finals. Competing in the 10,000m final on Thursday are Marissa Daniels and Becky Wade. The 10,000m final is set to run at 8:10 p.m.
PRINCETON, NEW JERSEY (June 12, 2008) Simnoa Chin of Houston was named by USRowing as a member of the legs-trunk-arms four with coxswain crew that will represent the United States at the 2008 Paralympic Games, pending United States Olympic Committee approval. Joining Chin on the eilte squad will be Jamie Dean (Pickerington, Ohio), Jesse Karmazin (Palm Beach Gardens, Fla.), Tracy Tackett (Phoenixville, Pa.) and Emma Preuschl (Indianapolis, Ind.). Dean, Karmazin and Tackett raced in the event at the 2007 FISA World Rowing Championships, finishing fifth, while Chin and Preuschl are first time adaptive national team members. The rest of the 2008 U.S. Paralympic Team for Rowing will be selected at the 2008 USRowing National Championships June 27-29 in West Windsor, N.J. The winners of the men’s adaptive single sculls, women’s adaptive single sculls and trunk-arms double sculls events at that regatta will earn spots on the team. This year marks the first time that rowing will be part of the Paralympic Games. FORT WORTH, TEXAS (June 12, 2008) TCU swimming and diving head coach Richard Sybesma announced the addition of eight swimmers for the spring signing period on Monday. The eight prep standouts will join four athletes that signed during the fall. Ashley Bolin is one of five swimmers that signed this spring to join the women’s team in the fall. Bolin, a native of Oshkosh, Wis., led her high school to its highest all-time finish of sixth at the state championships this past fall. Bolin posted the best individual showing of fourth in the 200-free at the championships. Zrinka Korac will join the Purple and White from Zagreb, Croatia. Korac, a freestyle and backstroke swimmer, claimed the Croatian national championship in the 100-free in 2005. Kelsey Krug will join the women’s swimming team from Austin, Texas. Krug competed on the 200-medley relay team that posted a fourth-place showing at the Texas 5A state championships this past season. Krug will swim in the butterfly and breaststroke events for TCU. Jennifer Oster will become the second swimmer on the women’s roster from Englewood, Colo., joining current freshman Brittney Martinez. Oster will look to compete in the backstroke and butterfly events for the Horned Frogs. Edgar Crespo is one of three swimmers to sign with the men’s team this spring. butterfly events for the Horned Frogs. “Edgar’s converted time would be a TCU record in the 100-breast,” said Sybesma. that posted a sixth-place showing at this year’s Texas 5A state championships. NEW YORK, NEW YORK (June 11 2008) CONCACAF (Confederation of North, Central American and Caribbean Association Football) have unveiled the preliminary round match-ups for the 2008-09 CONCACAF Champions League™ following the draw held today at the offices of the General Secretariat in New York City. Sixteen teams (BLZ1, CAN1, CFU1, CFU2, CFU3, CRC2, GUA2, HON2, MEX3, MEX4, NCA1, SLV2, PAN1, PAN2, USA3, USA4) where drawn into eight home-and-away match-ups in the Preliminary Stage which will take place on 26-28 August 2008 and 2-4 September 2008. The eight clubs have been also drawn into Group Stage today for the inaugural CONCACAF Champions League™ and CONCACAF will officially unveil the Group Stage along with the complete schedule for the preliminary round on Monday (16 June). The top two clubs from each of the four groups will advance to the Quarterfinals of the CONCACAF Champions League. These eight teams will be drawn into four Quarterfinal pairings to play home-and-away match-ups in February 2009. The four Quarterfinal winners will then play in two Semifinal home-and-away match-ups in March and April 2009 with the two Semifinal winners squaring-off in the home-and-away 2008-2009 CONCACAF Champions League™ Final in late April 2009. HOUSTON, TEXAS (June 11, 2008) Rice women's tennis standouts Julie Chao, Tiffany Lee and Rebecca Lin along with women's basketball players Maudess Fulton and Shyrelle Horne garnered 2008 Arthur Ashe, Jr. Sports-Scholar Awards as announced in Diverse Magazine's June issue. Chao, Lee and Fulton tallied Third-Team honors, while Horne and Lin took home Honorable Mention selections. Chao, a 2008 C-USA All-Academic team member, carries a 3.60 GPA as an economics major. She racked up a 22-10 overall singles record en route to All-Conference USA First Team singles pick. Lee and Lin anchored the middle of the Rice lineup as the Owls completed a 17-5 season, its best since the 1983 season. Lee won 10 of her 13 singles decisions at the No. 3 slot and Lin was 14-6 in the No. 4 hole. Fulton, a three-time C-USA Commissioner's Honor Roll winner, averaged 8.1 points and 3.4 rebounds per game. The New Jersey native holds a 3.39 GPA as a history major and netted a career-high 27 points on an 11-for-21 shooting effort at UCLA and secured C-USA Player of the Week for her efforts. Horne served as Rice's back-up point guard before missing the final 13 games of the season with a shoulder injury. She saw double-digit minutes in nine times and passed out at least three assists in six of those nine games. IRVING, TEXAS (June 11, 2008) Rice cross country athletes Marissa Daniels and Brad Morris along with men’s basketball player Paulius Packevicius have been named recipients of the 2007-08 C-USA Scholar Athlete of the Year Awards for their respective sports. The honors were announced Tuesday by Conference USA Commissioner Britton Banowsky following approval from the league’s Board of Directors. The awards are based on academic achievement (GPA), athletic achievement and service. Rice along with SMU, Tulsa and UTEP each had three student-athletes selected. Seven of C-USA’s 12 institutions produced at least one scholar athlete winner. In addition to the three student-athletes from Rice, also honored were East Carolina’s Hannah Priest (women’s tennis) and Kelley Wernert (volleyball); Houston’s James Cesario (baseball) and Jetta “Twiggy” McIntyre (women’s baseball) and Memphis’ Brad Benjamin (men’s golf). Also, SMU’s Kate Ackerson (women’s golf), Ben Shuleva (men’s soccer) and Jennifer Basel (swimming and diving); Tulsa’s Paul Smith (football), Sara Dyer (softball) and Amau Brugues (men’s tennis) and UTEP’s Jami Tullius (women’s soccer), Mickael Hanany (men’s track and field) and Keisha Walkes (women’s track and field). Daniels is a pre-medicine major who carries a 3.8 grade point average. She was also named the Conference USA Student-Athlete of the Year for cross country as a junior. Daniels is a two-time Academic All-American by the Women’s Intercollegiate Cross Country Association and was a 2007 Second-Team Academic All-American. The Pearland native led Rice to a record-setting performance as the team captured its second conference cross country title in the last three years and earned a spot in the national rankings. The Owls won their first NCAA South Central Regional championship and finished the season by finishing 17th at the NCAA Championships. Morris helped lead Rice men’s cross country team to an eighth-place finish at the NCAA South Central Regional. He was the Owls’ top finisher, placing 24th overall. Morris placed 18th at the Conference USA Championship as Rice placed third and during the year had a pair of top-three finishes. Academically, Morris carries a 3.66 grade point average in chemistry. He is a three-time selection to the Conference USA Commissioner’s Honor Roll and was a 2006 Academic Medal recipient at Rice. Packevicius was a repeat selection on the Conference USA Men’s Basketball All-Academic Team this year. He was a three-time selection to the C-USA Commissioner’s Honor Roll with a 3.58 grade point average in economics and managerial studies. The native of Kaunas, Lithuania, played in the Owls’ first 18 games of his senior season before suffering a season-ending injury in a late, January practice. At the time of his injury, he was averaging 11.1 points and 9.8 rebounds per game (second in Conference USA). Packevicius was named to the ESPN The Magazine Academic All-District VI team. CHICAGO, ILLINOIS (June 10, 2008) Mexican goalkeeper Oswaldo Sanchez was charged with misdemeanor counts of criminal trespassing and resisting arrest after a rowdy incident in a hotel, according to Chicago police. He was released and ordered to appear in court July 11. Police said the arrest was made shortly before 7 a.m. in downtown Chicago, where Mexico beat Peru 4-0 the night before in a friendly at Soldier Field with Sanchez in goal. According to some reports, hotel guests complained about a loud party by players in the early hours of the morning. The incident should not have any impact on Sanchez's visa status for Sunday's World Cup qualifier against Belize in Houston. But a criminal conviction could complicate his ability to obtain travel visas for future Mexico games in the United States. David Villa notched the first hat-trick of the tournament to help Spain defeat Russia 4-1 in their Euro 2008 Group C opener on Tuesday. Russia scored with a header from Roman Pavlyuchenko before substitute Cesc Fabregas dove to nod Spain's fourth goal from close range in stopage time. Zlatan Ibrahimovic scored his first international goal in more than two and a half years to send Sweden on the way to a 2-0 victory over champions Greece. Petter Hansson garnered the second goal five minutes later to put Sweden level on points with Spain, who beat Russia 4-1 in the other Group D game earlier. Tomorrow (Wednesday) will see the Czech Republic against Portugal and Switzerland facing Turkey in Group A action. Shay paced the league with a .421 batting average (8-for-19) with a 3 for 4 performance in the BeachDawgs' come from behind extra-inning win against McKinney on June 3. In addition he went 2 for 4 against Texarkana, scoring the tying run in the sixth. Sisk turned in the CBL's first complete-game shutout against McKinney on June 8, striking out 8 while walking 3. He faced Ryan Leger to gain the 1-0 win over the Blue Thunder. For the week, Sisk allowed only one earned run, striking out 13 batters in 14 innings of work while posting a 0.64 ERA. Shay's Beachdawgs are currently in first place in CBL standings, going 11-6 (.647) while remaining undefeated at home (8-0). Sisk's Toros are in second place (10-7, .588), a single game behind the BeachDawgs. DURHAM, NORTH CAROLINA (June 10, 2008) Baylor sophomore infielder Shaver Hansen has accepted an invitation to the 2008 USA Baseball National Team Trials, the nation's governing body of amateur baseball announced Monday. Hansen was among eight players named Monday in the final wave of invitees. In all, 34 players will attend trials and vie for 22 spots on the National Team roster, which will be announced June 24. Hansen is the second Baylor student-athlete invited to the National Team Trials this season. Sophomore right-handed pitcher Kendal Volz accepted an invitation in late May. Hansen is Baylor's first position player invited to the National Team Trials since outfielder Michael Griffin in 2003. The 2008 USA Baseball National Team Trials will be held June 11-23 throughout the northeast and southeast United States. The National Team schedule includes a six-game friendship series against Chinese Taipei in late-June and a month-long trip to Europe wherein the team will compete in the Haarlem Baseball Week in the Netherlands and the IV FISU World Collegiate Baseball Championship in the Czech Republic. A product of Fruita Monument High School in Grand Junction, Colo., Hansen led Baylor this season in batting average (.326), hits (72), runs (48), triples (six) and RBI (47). He also was third on the team in doubles (16) and walks (32), tied for the team lead in total bases (118), and was second on the team in slugging percentage (.534) and on base percentage (.413). Hansen was third on the team with eight stolen bases in 12 attempts, and he finished fourth in the Big 12 this season in triples. In two seasons at Baylor, Hansen has appeared in 112 games with 107 starts. He totes a .312 career batting average with nine home runs, 82 RBI, 30 doubles, seven triples, 82 runs and 15 stolen bases. The 2008 USA Baseball National Team will be led by Oral Roberts University head coach Rob Walton, who served as an assistant coach for the 2005 National Team. Walton is joined on the 2008 staff by pitching coach Jerry Meyers (head coach, Old Dominion University), assistant coach Nino Giarratano (head coach, University of San Francisco), and assistant coach Ritch Price (head coach, University of Kansas). HOUSTON, TEXAS (June 9, 2008) – The Houston Dynamo will host their third Annual Dynamo Community Day, presented by The Methodist Hospital System, on Saturday, June 14, in partnership with the newly developed Discovery Green Park in downtown Houston. The event will take place along Discovery Green’s Jones Lawn and is scheduled to run from noon-2 p.m. Families and individuals are invited to learn about health and environmental initiatives, participate in fun activities, donate to charitable programs and win prizes. The Dynamo Girls, Dynamo Diesel, Dynamo players and team coaches will be present at the park to meet and entertain guests. Players will be available for autographs during a special one-hour signing session. In addition, the band “Orange is In” will perform. The Dynamo Drive Series continues during the event, collecting gently used soccer gear to benefit the US Soccer Passback Program. In addition, guests can check their vital health levels and receive massages from certified therapists. Other initiatives include a silent auction and bake sale, with proceeds from both activities benefiting the Methodist Cancer Center. Other local sponsors will host community activities, including the National Association of Latino Elected Officials, which will register voters as part of National Citizenship Day. Fans will also have the opportunity to take part in the Father’s Day Challenge, in which fathers and children can participate in a friendly competition against Dynamo team dads, including coaches Dominic Kinnear and John Spencer. HOUSTON, TEXAS (June 10, 2008) Mexico kicks off its 2008 World Cup Qualifying campaign against Belize on Sunday, June 15 at Reliant Stadium in Houston Texas. The game will probably mark the coaching debut of new Mexico coach Sven-Goran Eriksson. The match will be the first FIFA World Cup qualifier to be played in Houston. The match is the first of a home-and-home series between the nations as they begin the quest to compete in the FIFA World Cup finals in South Africa in 2010. Belize will be the home team for the match, as the second leg will be played in Mexico on Saturday, June 21. This match marks the beginning of the second round of World Cup qualifying and will be the first time that Belize has played in Houston. Mexico on the other hand will be making their third trip to Houston in the last 12 months . Last year Mexico beat Costa Rica 1-0 in Houston in front of over 70,000 fans, so expect tickets for this game to go fast. HOUSTON, TEXAS (June 9, 2008) Six Texas gymnasts were recently selected to compete at the 2008 U.S. Olympic Gymnastics Team Trials scheduled for June 19-22 in Philadelphia. In the women's division, Alaina Johnson of Tyler (Texas East), Nastia Liukin of Parker, (WOGA), Chelsea Davis of Lakeway (Texas Dreams) will join men's selections Raj Bhavsar, Jonathan Horton, and Sean Townsend, all from Houston representing Team Chevron at the trials. Johnson, who is the 2007 all-around world champion, earned a combined score of 127.500 to win the VISA all-around championship. Liukin, the 2005-06 U.S. all-around champion, finished second with a 126.500. Johnson won floor exercise with a combined score of 32.250. Liukin claimed two individual event titles: uneven bars with a score of 34.150 and balance beam with a 32.450. Sacramone, who has three world vault medals to her credit, won vault with a score of 30.700 for her fourth straight U.S. vault crown. Win: Daniel Chaffardet (1-0). Loss: Brandon Kelly (0-2). Save: Brandon Pello (3). BAYTOWN, TEXAS (June 7, 2008) Derek McGahee of Clear Creek High School scored on a 28-yard interception return to close out the evening and secure a 24-14 Texas win over Louisiana in Saturday's Bayou Bowl at Stallworth Stadium. The Texas victory broke a three-year Louisiana winning streak and tied the all-time series at 3-3. After a restart of the game due to a television malfunction, Louisiana scored first on a 15-yard pass from Randall Mackey to Edward Patterson with 10:24 left in the quarter. Mackey also connected on a 53-yard pass to Alfred Franklin to pull the score within 17-14 left in the game. Texas evened the bowl series at 3-3 by defeating Louisiana for the first time in three years. Jeremiah McGinty of North Shore and Westside's Michael Smith connected on an 8-yard scoring pass with 4:25 remaining in the first period. Colin Baker added a 21-yard field goal in the third quarter to give Texas a 17-7 lead. Win: Russell Revere (2-1). Loss: John Milton (1-1). Win: Rob Alzuarde (1-0). Loss: Phil Monte (0-1). LAKE BUENA VISTA, FLORIDA (June 7, 2008) Five Baylor baseball student-athletes were selected in Friday’s second day of the 2008 Major League Baseball First-Year Player Draft. Junior shortstop Beamer Weems led the group, going to the San Diego Padres in the eighth round with the 255th overall pick. At least one Baylor player has been drafted every year since 1991, and 14 Baylor pitchers have been drafted in the last five years. Four Baylor pitchers were selected. The Cincinnati Reds took two of those arms, drafting junior southpaw Mace Thurman in the 17th round with the 569th overall pick and senior right-hander Randall Linebaugh in the 37th round with the 1109th overall pick. Senior right-hander Tim Matthews was selected by the Colorado Rockies in the 27th round with the 827th overall pick, and senior right-hander Nick Cassavechia was selected by the Detroit Tigers in the 37th round with the 1123rd overall pick. Weems, one of only two Baylor shortstops to earn all-conference honors three consecutive years, is a career .296 hitter with 24 home runs, 136 RBI, 41 doubles and 12 triples. Arguably the best defensive shortstop in Baylor history, Weems holds Baylor career and season (9, 2007) records for homers by a shortstop. Weems is the fifth Baylor player drafted as a shortstop in the first 10 rounds, joining Steve Macko (5th round, 1977), Jace Brewer (5th round, 2000), Trey Webb (5th round, 2003) and Kyle Reynolds (6th round, 2005). Thurman posted a 3-1 record with a staff-low 3.18 ERA and two saves this season, his first at Baylor after spending two years at Waco’s McLennan Community College. He appeared in 20 games with one start. Thurman logged 42 strikeouts in 39.2 innings and held opponents to a .209 batting average. Matthews spent three seasons at Baylor after beginning his collegiate career at UT Tyler. He was 13-9 in his Baylor career with a 4.89 ERA and four saves. Matthews appeared in 62 games with 20 starts and recorded 101 strikeouts in 162.0 innings. This season, he was 5-2 with a 4.91 ERA and two saves, and his 40-to-9 strikeout-to-walk ratio ranked as the second-best season average in Baylor history. Linebaugh, the only four-time letterman on this year’s Baylor squad, appeared in 67 games with 27 starts in his Baylor career. He was 11-6 with a 5.01 ERA and one save. Linebaugh recorded 162 strikeouts in 206.2 innings. This season, he was 1-0 in 17 appearances with one start and one save. Cassavechia finished his Baylor career second on the program’s career saves list with 24. With eight saves in 2006 and 11 saves in 2007, Cassavechia joined Zane Carlson as the only Baylor pitchers to record at least eight saves in consecutive seasons, and Cassavechia is the only Baylor pitcher to lead the team in saves in three consecutive seasons. He was 9-9 in his career with a 3.83 ERA in 80 appearances, all relief efforts. Cassavechia is tied for seventh all-time at Baylor in career appearances and ranks fourth in school history in relief appearances. Additionally, two members of Baylor’s fall signing class also were drafted. Lucas Hileman, an outfielder from Anna-Jonesboro High School in Illinois, was selected in the 37th round by the Atlanta Braves with the 1120th overall pick. The San Francisco Giants used their 43rd-round pick, the 1374th overall, to draft Joey Hainsfurther, a shortstop from Highland Park High School in Dallas, Texas. Hileman and Hainsfurther are due to join the Baylor program this fall. Games of Friday, June 6, 2008. Win: Ryan Kondratowiz (1-1). Loss: Tyler French (0-1). Save: Brandon Pello (2). Schedule for Saturday, June 7 and Sunday, June 8, 2008. HOUSTON, TEXAS (June 6, 2008) Two Rice student-athletes were recently named to the ESPN The Magazine/CoSIDA Academic All-District VI men's track & field/cross country teams. The College Sports Information Directors of America (CoSIDA) selects the team for each district. Earning first team accolades were Brett Olson, a senior from Flower Mound, Texas, who sports a 3.95 grade point average (GPA) in mechanical engineering and civil engineering and sophomore Phillip Adam, from Santa Maria, Calif., who has a 3.90 GPA in economics. This is Olson's second such award as he was also named to the 2007All-District VI team. He also earned the 2007 and 2008 Rice University Scholar Athlete of the Year honor as well as the 2007 and 2008 Rice Scholar Athlete for men's track and Field. Olson was named to the 2008 C-USA All-Academic Team for men's cross country, the 2007 and 2008 C-USA All-Academic Team for track & field, and he was a member of the 2006, 2007, and 2008 C-USA Academic Medal and Honor Roll. He earned the bronze at the C-USA Outdoor Championship in the 3000m steeplechase with a time of 9:33.12 and he placed seventh in the 5000m (15:07.36) and eighth in 3000m (8:47.37) at the C-USA Indoor championship. Adam, the Owls' top decathlete, earned the 2007 and 2008 Conference USA Commissioner's Academic Medal and was on the 2007 and 2008 Conference USA Commissioner's Honor Roll. In competition, Adam placed second at the C-USA Outdoor Championship in the decathlon with 6,756 points and he was the 2008 C-USA Indoor champion in the penthalon with 5,317 points. To be nominated, the student-athlete must be a starter or important reserve with at least a 3.20 cumulative grade point average (on a 4.0 scale) for his career. No athlete is eligible until he has reached sophomore athletic and academic standing at his current institution (thus, true freshmen, red-shirt freshmen and ineligible transfers are not eligible). In the cases of transfers, graduate students and junior college graduates, the athlete must have completed one full academic year at the nominating institution to be eligible. HOUSTON, TEXAS (June 6, 2008) Saluting its rich history and tradition, University of Houston Director of Athletics Dave Maggard announced on Wednesday that nine former Cougar standouts and one great team will be inducted into the UH Hall of Honor this fall. The Hall of Honor gala will take place on Friday, November 15, at the Hyatt Regency Houston. The Class of 2008 includes a record-breaking quarterback, a three-time golf All-America, a basketball legend that played for the Harlem Globetrotters, two Olympic medalists, an All-America shortstop, an NFL head coach and former three-time Southwest Conference Coach of the Year. The class is headlined by the first-ever induction of an entire team, as the historic 1967-68 men's basketball squad has its place in the illustrious hall. This team played in the NCAA Final Four, but its game against UCLA in the Astrodome, known as the "Game of the Century," put the national spotlight on Division I basketball. "Celebrating tradition is a big part of every outstanding university," Maggard said. "The individuals who have been nominated for this years University of Houston Hall of Honor are individuals who have exhibited not only their athletic skill while here at Houston, but also have continued to represent the athletic department and our University in an exemplary fashion. "We are very proud to induct these individuals and this special team to Houston Hall of Honor. They have truly enriched the tradition of University of Houston." Quarterback David Klingler joins fellow Run-n-Shoot signal-caller Andre Ware in the Hall of Honor, as does former UH linebacker and current Dallas Cowboys head coach Wade Phillips. Tight end Riley Odoms, a four-time Pro-Bowler for the Denver Broncos, also will be inducted. Joining the '67-68 basketball squad in the hoops division is basketball legend "Sweet Lou" Dunbar. Dunbar, who starred for Cougars from 1972-75, gained fame as a member of the Harlem Globetrotters. PGA Golfer Keith Fergus was a three-time All-America for the Cougars, and he later led the Houston golf program after legendary Dave Williams retired in 1987. As a coach, Fergus led the Cougars to eight tournament titles. Two Olympic medalists join a long list of hardware-toting Hall of Honor members, as the athletics department inducts Rita Crockett (volleyball silver medal) and sprinter Kirk Baptiste (silver medal) during the ceremony. Crockett starred for one season for the Cougars, but she later helped lead the USA Volleyball team to a silver medal in the 1984 Olympics in Los Angeles. As for Baptiste, he captured the silver medal in the 200-meters in Los Angeles, finishing second to Carl Lewis, a 1998 Hall of Honor inductee. Baseball standout Carlton Hanta becomes just the fifth baseball player to get the call to join the Hall of Honor. An All-America shortstop, Hanta led the Cougars to the 1953 College World Series. Finally, former swimming and diving head coach Phill Hansel takes his place in the illustrious hall, joining former coaching colleagues Guy V. Lewis (basketball), Tom Tellez (track and field), Rolan Walton (baseball), Dave Williams (golf) and Bill Yeoman (football), as well as administrators Harry Fouke, Sue Garrison, Ted Nance and Tom Wilson, as contributors to Cougar success. FIELD ANNOUNCED FOR 2009 ITA "KICK-OFF WEEKEND"
FORT WORTH, TEXAS (June 5, 2008) The draft for the 2009 ITA “Kick-off Weekend” was conducted on Wednesday, as 15 sites will host four different teams to determine who advances to the ITA National Team Indoor Championships on Feb. 13-16 in Madison, Wis. The TCU women’s tennis team will compete at the Georgia Tech regional in Atlanta, Ga.
regional under the new ITA Team Indoor expansion will make up the field of 16 at the tournament on the campus of the University of Wisconsin. prestigious ITA National Team Indoor Championships. The Frogs finished the 2008 season with a No. 26 national ranking. WACO, TEXAS (June 5, 2008) Twenty-five current Baylor baseball student-athletes will participate in collegiate summer baseball leagues this year, including eight in the prestigious Cape Cod League. Baylor also has placed student-athletes in the Texas Collegiate League, the Northwoods League, the Central Illinois Collegiate League, the Karl Young League and the Dallas Amateur Baseball Association. Kendal Volz headlines the group headed to the Cape Cod League. However, Volz, who is assigned to the Wareham Gatemen for the second consecutive summer, first will participate in the USA Baseball National Team Trials. Volz will only join the Gatemen if he does not make the National Team. Raynor Campbell (Wareham), Craig Fritsch (Yarmouth-Dennis), Gregg Glime (Chatham), Shaver Hansen (Harwich), Willie Kempf (Harwich), Aaron Miller (Chatham) and Shawn Tolleson (Yarmouth-Dennis) also are headed to the Cape Cod League. This is Glime’s second summer in the Cape, while the others will spend their first summers in the league, which begins play June 13. Eight Bears will play in the Northwoods League: Don Lambert (Madison), Wade Mackey (Eau Claire), Brooks Pinckard (Eau Claire), Chris Slater (Wisconsin), Ross Speed (Rochester), Mace Thurman (Rochester), Landis Ware (Eau Claire) and Reed Woytek (Madison). The Northwoods League began play May 29. Three Bears will play in the Central Illinois Collegiate League: Dan Evatt (Danville), Tom Filip (DuPage County) and Brooks Kimmey (Danville). The CICL begins play Thursday. Dustin Dickerson and Eric Udell both will play for Brazos Valley of the Texas Collegiate League, which begins play June 10. Andrew Cooley will play for the Houston Skysox of the Karl Young League (play began Monday), and Kel Presley will play for the Dallas Texans of the Dallas Amateur Baseball Association (May 25). WASHINGTON, DC (June 5, 2008) The Houston Dynamo, two-time defending MLS Cup champions, visited the White House today to be congratulated by President George W. Bush for their back-to-back MLS Cup championships. 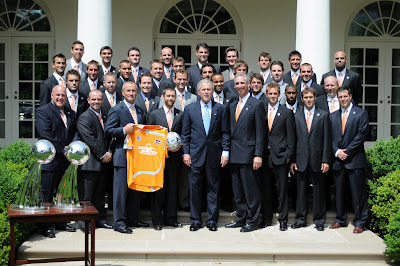 Yesterday’s match against D.C. United was postponed, but the Dynamo continued their trip with a morning tour of the White House, then met with President Bush and posed for a team picture in the Rose Garden. Bush then brought the entire roster into the Oval Office and took individual pictures with each player, a rare opportunity for the two-time defending champions. The team returns to Houston later today. The visit honored the team’s 2007 MLS Cup championship, won in Washington, D.C. on November 18, 2007 with a 2-1 victory over the New England Revolution. With today’s visit, the Dynamo become the first MLS squad to make consecutive visits to the White House. To celebrate the team’s trip and its two consecutive championships, the first 7,500 fans in attendance for the June 8 game against Toronto FC will receive a specially designed Dynamo championship lapel pin like those worn by the team on its White House visit. Houston business Lucho’s Men’s Clothing provided the attire worn by Dynamo players and staff for the visit. LINCOLN, NEBRASKA, (June 5, 2008) The Prairie View A&M University Men's Track team wrapped up their season at the 2008 NCAA Midwest Regional. The Panthers competed in the Men's 200 Meter Dash, the 4 x 100 Meter, and the 4 x 400 Meter Relays. The Panthers 4 x 100 Meter team consisted of Chris Taylor, Brandon Samples, Jason Okoro, Jarryd Gray, and Jason Fobbs. PVAMU's 4 x 400 Meter team was composed of Jason Mitchell, Daniel Anderson, Jared Alexander, Jarryd Gray, and Jason Okoro. Gray also ran in the 200 Meter dash. Prairie View A&M finished 7th in the 4 x 400 Meter Relay (3:08.08) and 9th in the 4 x 100 (40.47) Meter Relay. Individually, Gray finished 19th in the 200 Meter dash with a time of 21.31. This season Prairie View A&M's track and field squad won Southwestern Athletic Conference Titles in Men's Indoor and Outdoor Track Field making a sweep of both championships during the year.